Restrictions on humanitarian convoys imposed by Syria's government have frustrated efforts to deliver life-saving aid to besieged people in the war-ravaged country, UN envoy Staffan de Mistura said Thursday. A 17-country United Nations panel, co-chaired by the United States and Russia, has been working since February to boost aid deliveries to an estimated 450,000 Syrians stranded in besieged areas, as well as 4 million others in places the UN describes as hard-to-reach. After reporting significant progress through the first two weeks of March, UN officials have in recent weeks voiced mounting concern over the obstacles imposed by Damascus. "Everyone in the meeting was disappointed," de Mistura told reporters after a weekly meeting of the so-called humanitarian taskforce. "Many of (the countries) are actually frustrated by the lack of new convoys," he added. He listed Duma, Daraya and East Harasta, all besieged by the regime, as being among the areas in urgent need of supplies. De Mistura said he raised the issue of flagging humanitarian cooperation with President Bashar al-Assad's government while in Damascus earlier this week during a preparatory meeting for peace talks, which resumed in Geneva on Wednesday. Asked why the regime was continuing to block aid convoys, de Mistura said that question should be put to Assad's government. 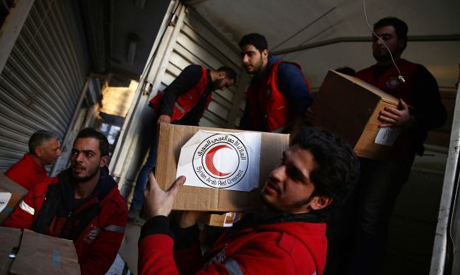 Since the start of the year, UN, International Red Cross (ICRC) and Syrian Red Crescent convoys have delivered aid to 154,000 people in besieged areas and roughly 246,000 others in hard-to-reach areas. The head of the humanitarian taskforce, Jan Egeland, has said the goal of reaching more than 1 million people before the end of April would not be achieved unless the government became more cooperative. De Mistura said he made some progress in Damascus by securing tentative permission for the distribution of medical supplies, but the government had specifically excluded surgical equipment, anti-anxiety pills and atropine, which can be used to guard against poison, including sarin gas. Humanitarian air drops over Islamic State group-besieged Deir Ezzor continued on Thursday, de Mistura said, marking the third one since the World Food Programme carried out a first successful drop over the weekend. The UN is trying to get supplies to 200,000 people in Deir Ezzor living under the control of the Islamic State (IS) group.